An upper ridge is centered over N Atlantic and W Europe, while a deep trough moves across NE Europe. An associated short-wave trough moves across Belarus towards Russia. Another short-wave trough continues south across the Balkan peninsula and Mediterranean. A large upper low intensifies over Morocco and Algeria. A new deep trough develops over Greenland and results in tightening pressure gradient towards Iceland. ENH / SLGT risks have been issued across the N Adriatic region, Ligurian bay, Apennines and Corsica with threat for severe to locally extremely severe winds in excess of 120-130 km/h. Peak gusts of downslope Bora winds are expected in the Kvarner region (Croatia) and Ligurian bay towards the NW Corsica, likely approaching 150 km/h at the most exposed locations. 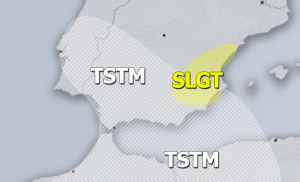 ENH / SLGT risk areas have been issued across the Alboran sea through the Strait of Gibraltar with threat for severe to extremely severe winds, locally in excess of 120 km/h. 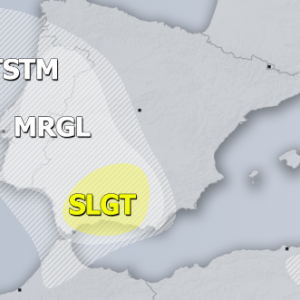 SLGT risk has been issued for N Morocco and N Algeria with threat for severe storms capable of producing large hail, severe winds and torrential rainfall. 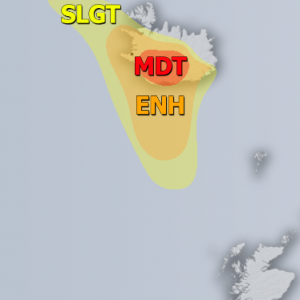 SLGT risk has been issued for parts of N Atlantic and NW Iceland with threat for severe winds, locally in excess of 100 km/h. MRGL risk has been issued for south-central Italy, south-central Adriatic sea into the Ionian sea and Greece where isolated severe storms are possible, capable of producing marginal hail, torrential rainfall and strong to severe winds along the leading cold front.